The brand new Flexitog Eider Leather Palm Thermal Gloves FG645 use Clo insulation to provide superior warmth, while their ergonomic curved design ensures total comfort for most users. 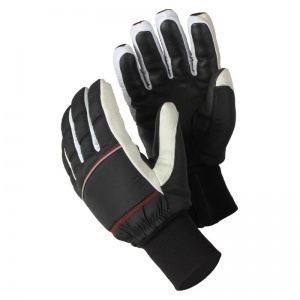 The gloves feature a nylon taslan back that provides greater flexibility, while their extra long design provides additional mechanical protection and prevents cold draughts. The Eider Leather Palm Thermal Gloves use the brand new Clo insulation technology that offers superior grip, comfort and warmth, making the gloves perfect for use in harsh, cold conditions. They are ergonomically designed for enhanced comfort, while a goat leather palm guarantees durability which is perfect for tough environments that require protection from wear and tear.